When it comes to parties, no matter what the occasion, there is usually plenty of food and maybe even some music, but what about entertainment? If you don’t have enough activities planned to keep your guests occupied, they will probably start to disappear when the food does. If you’re planning the next big party at your house you might want to consider having some game tables set up throughout the room. It’s simple, just spread the tables out to give people enough room to get to the food table and make sure you have at least four chairs put up around the tables. You should put a different game on each table with a pad of paper and some pencils for scoring. The games should be age appropriate and fun for everyone in the group. Think about games that won’t take a long time to play, ones that will feel the room with laughter, and try to avoid ones that will cause a family feud. People like card games, team games, and trivia is always fun. If you like the idea of the trivia games for your party, then think about the age group once again and try to find something that will fit for everyone. Don’t choose a game that requires a group of scholars to answer the questions if the people playing haven’t graduated the eighth grade yet and at the same time don’t choose a game that has you guessing animal sounds if the people in the room have graduated from college. It’s also easy to choose games that will fit in with a group of mixed ages, you can always make each table age specific. The idea is to allow as much fun into the room as possible. If you need some help in trying to decide which games you should choose, you have no need to worry. The following is a list of 10 of the best trivia board games for parties this year. We have sorted them out for you, so you can easily pick the ones that are age appropriate for your group and we have even compared some of the pros and cons for you. When you’re finished, you should be on your way to planning your next big party. 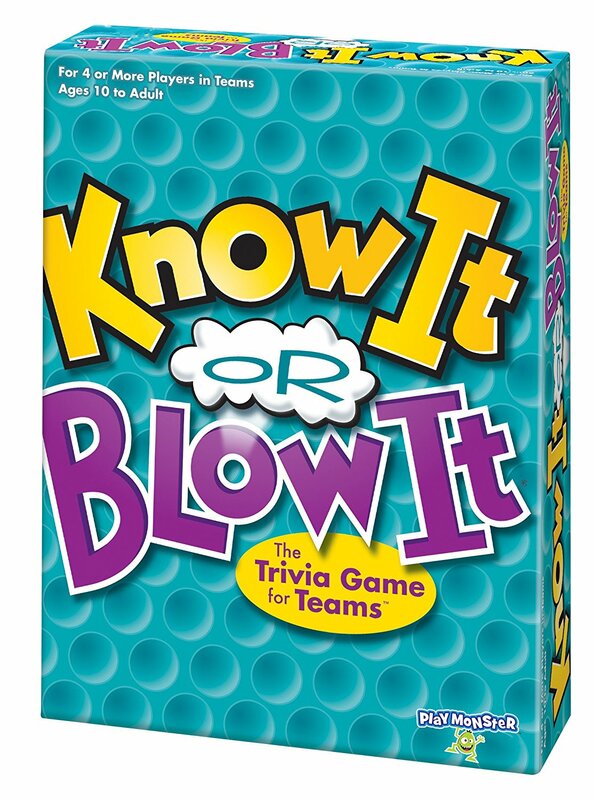 This is not your usual trivia game and it doesn’t require expertise and special skills to beat your opponents. Anyone can play but the younger people in the group might need a little more help. Number of Players: For 4 or more players, but it seems to be best with 5-7 players and some people have even played successfully with 3. Description: This is a simple yet fun game for a social gathering or family game night. The pieces are of high quality and easy to set up for play. The answers in this game are usually not ones that are commonly known but that’s ok because you can just guess the answer. Your answers don’t even need to be right to win the game because everyone will be wagering bets on which one is the right answer, and even then, it will be the one who is the closest. You can bet on someone else’s answer if you think it’s a better choice than yours. The person who is the closest without going over wins the chips, and you guessed it, the one at the end who has the most chips wins the game. 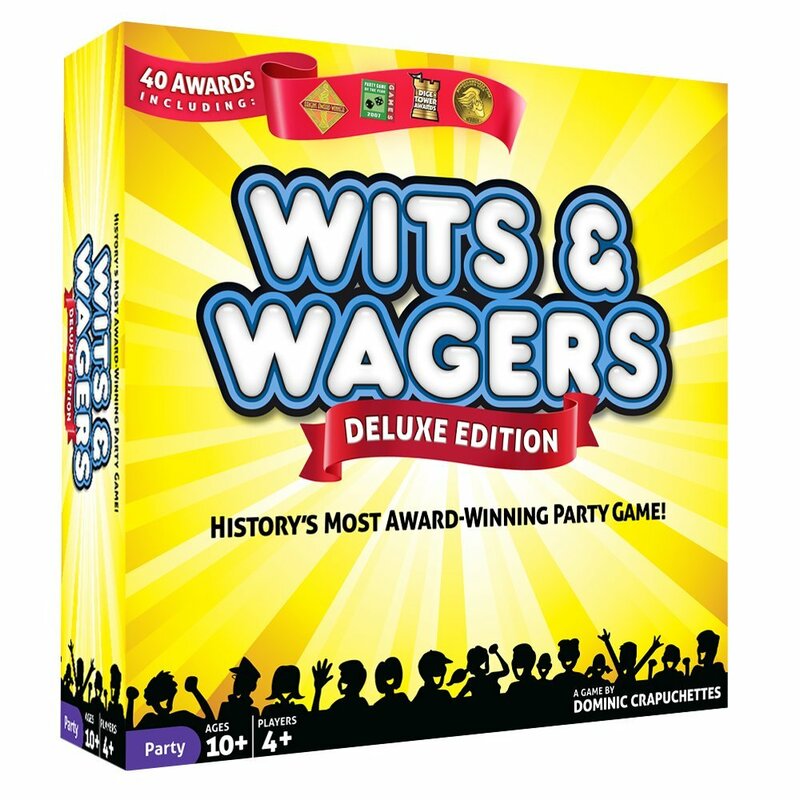 With only seven rounds, Wits & Wagers doesn’t take a long time to play, but you should use caution because it is addicting. 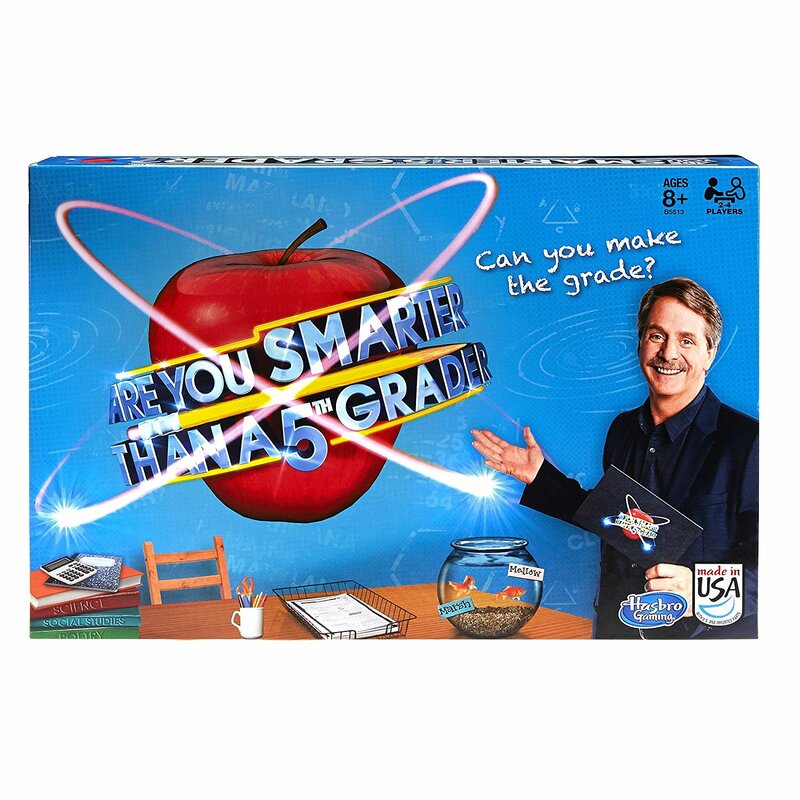 This is a classic and one of the most famous trivia board games since 1979. This is the classic edition, but it is filled with modern questions. This is an opportunity for the grandparents to introduce a classic to their grandchildren, and maybe even show them who has the most wits. Number of Players: For 2-6 players individual or team play. Description: This game is packed with so many new and relevant general knowledge and pop culture questions that any trivia nerd will be sure to enjoy it. The questions can be extremely hard, so you should lock up all the cell phones before you begin to play, or you might find someone in the group trying to cheat. The object of the game is to move around the board answering the questions and filling up your pie. Each color corresponds to one of the six categories and it will be your job to get all six colors in your pie before the others, so you can win the game. 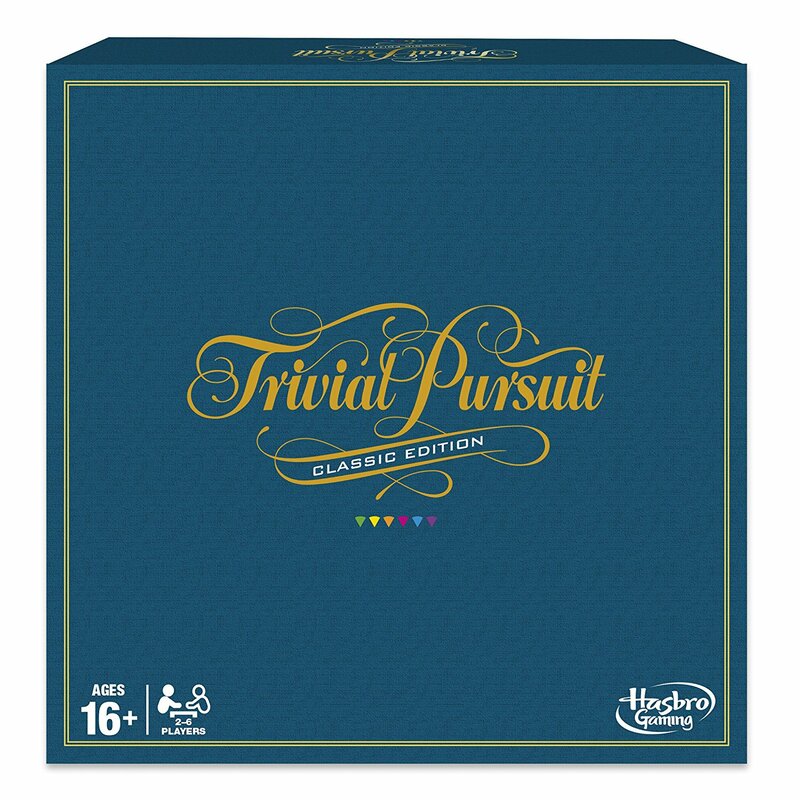 The first person with all six colors will be challenged with a bonus question and if they get it right they will earn their bragging rights, but if not, the others can laugh at them as they will have to wait and try again on their next turn. This game can be played in teams to make it easier, and it will take a little more time to play, so be sure the snack bowls are full. 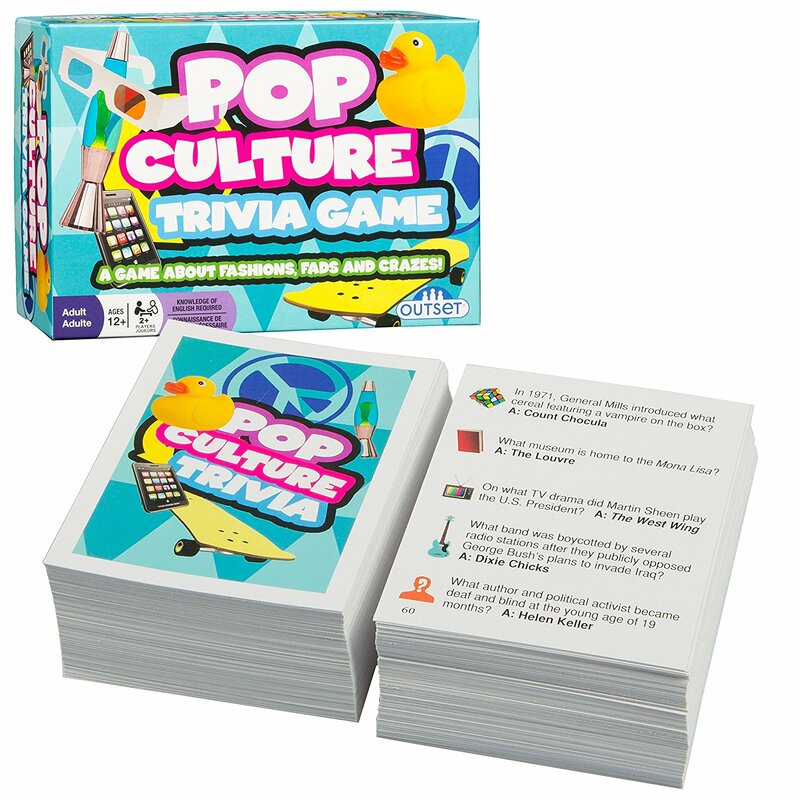 Pop Culture is a fast-paced trivia game that can be played by small or large groups. If you choose to play this game though, you might want to do a little homework beforehand, so you can be up to date on all those pop culture events. Number of Players: For 2 or more players and the more the better. Description: The variety of questions on these cards were created for all ages to compete together. The questions are about products, TV, film, music, books, comics, art, and people, so there is a little something for everyone here. You should probably have some knowledge about current actors and musicians but knowing about older ones isn’t a bad idea either. The object of this game is to be the first person to answer two questions correctly in each category. You will need that paper and pencil for this game, so you can keep score. It’s a simple game that can be played on the floor if all the tables are taken. Young or old, anyone can enjoy this game of knowledge. Travel across the country to see who knows more, the kids or the adults. Number of Players: For 2 to 6 players, but if you have more, it can easily be played in teams. 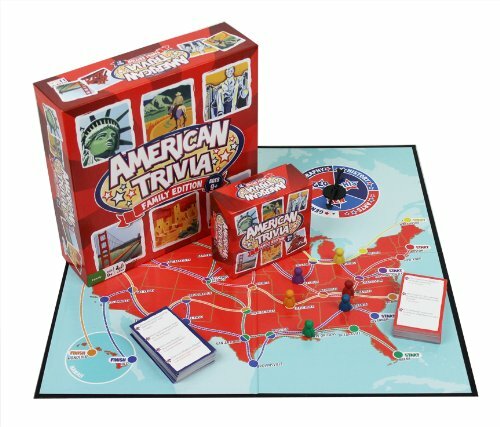 Description: The American Trivia family game can be played with mixed ages and will be enjoyed equally by everyone. The cards are two-sided with one containing questions for the kids and the other with the adult questions, and just because they are separated doesn’t mean the adults can’t be challenged with the same questions as the kids. The object of the game is to travel across the country answering questions about history, geography, general knowledge, and for the adults, art questions are added in there. The first person to reach the end of the map wins the game. Not only is this a fun party game, but it can also be incorporated into the classroom and it makes the perfect homeschool activity as well. No matter your age, you won’t be disappointed. For an added twist, you could make up two teams, the adults vs. the children to see who knows more. This is the perfect team game for a large or small group of people who love an honest competition. It’s fun and can be enjoyed by all ages. Number of Players: For 4 or more players in teams. The bigger the teams the better the game. Ages: For ages 10 and up but could probably be played with younger children too with some help. Playing Time: It will vary according to the size of the groups. Description: Break open this game and divide up the teams. The variety of questions in this game were created so there would be a little something for everyone. The object of this game is to be the first team to get all the way to the end of the board. You can do this by gaining a point for each correct answer. Every question asked will involve answering how many of something there are. For example, the question could ask you to name 5 miniature dog breeds. Each team player will then get a chance to answer. Your team will get a point for each correct answer and if you don’t know, it’s best to stop and keep the points because if you guess a wrong answer, you will blow it for your team and lose all the points. The categories are general knowledge and won’t require you to get it right to gain a point, just make sure you give up if you don’t know the answer. The further along the board you go, the harder the questions will be to answer, so be careful who you pick for your teammates. You could probably play this game many times with different groups and not always win because you never know who you might get on your team the next time. For a great icebreaker, you might want to try this Pub Trivia game. It’s played in teams and can be a great social event full of fun for all ages. Playing Time: It is played in five rounds and moves at a fast pace. 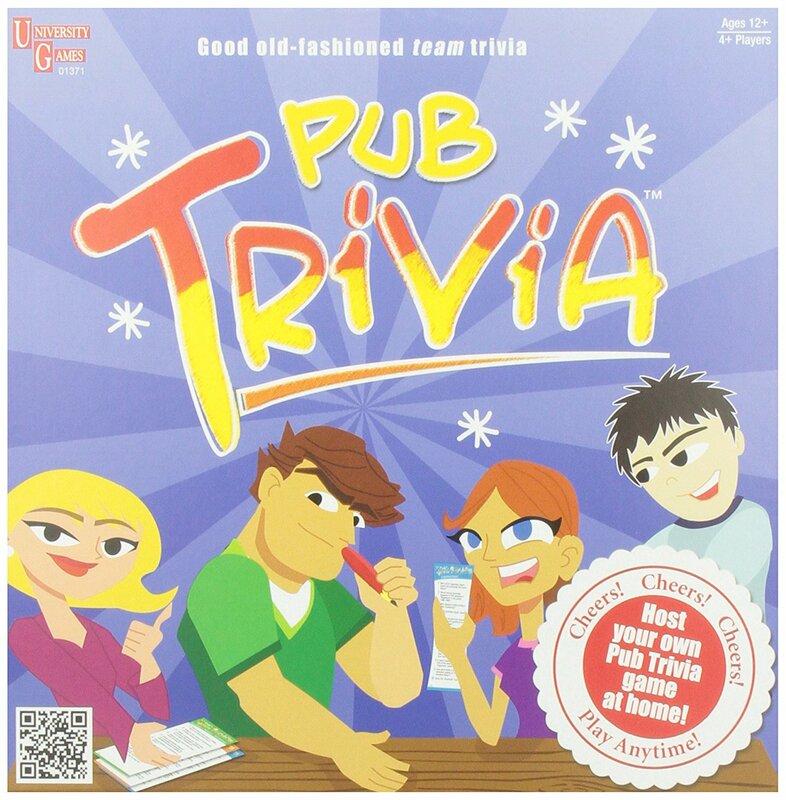 Description: Based on weekly trivia games played throughout bars and pubs, you can now play this game at home, and no drinking is required to enjoy it. There are 1000 general knowledge questions, so you can play it for a long time without running out. One person is the host of the game and will read the questions to the team. Players will then compete to get as many points as they can to win the game. The host will then add up the scores or you can pass them off to the other teams for scoring while the host reads the correct answers. The team with the most points at the end of five rounds wins the game. This could be a great game for meeting new people. 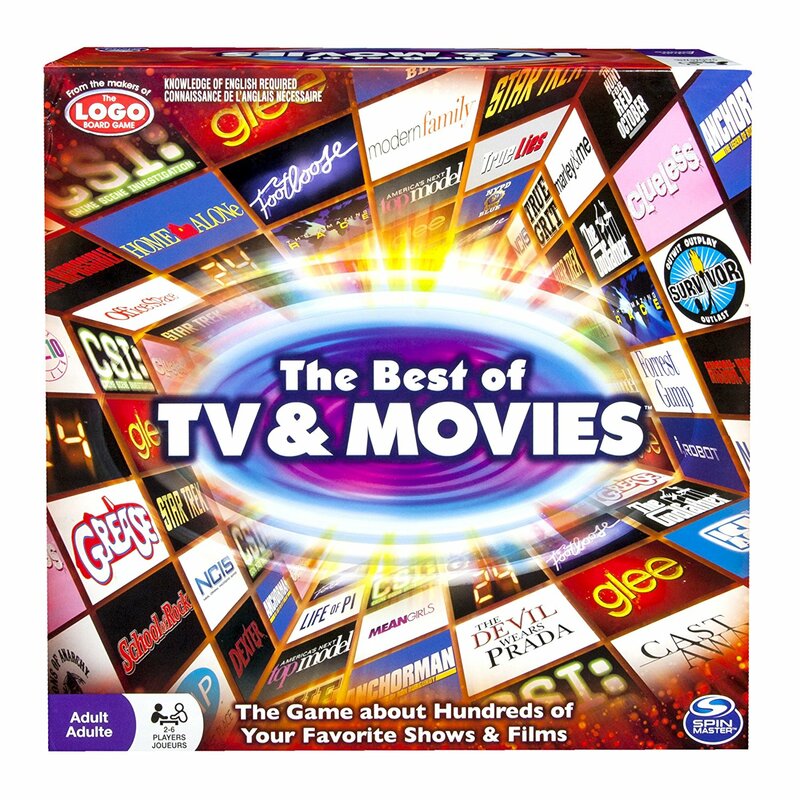 Calling all you TV and movie buffs, this game is the perfect choice for you. Play it in teams or show off your smarts alone, either way, this one is fun for everyone. Ages: This game is best for adults, but teens could be mixed with adults in teams. Playing Time: This varies with the number of players and the individual or team rules. Description: If you have ever played the Logo game then you will understand the rules of this game because it was created by the same makers. The rules differ depending on individual or team play, but the object, in either case, is to be the first player to get to the winning zone. Once in the zone, you will be required to get two answers in a row correct to win the game. You can achieve these goals by getting as many answers right as you can in the different categories and moving your way around the board. There are picture cards with related questions, theme cards with the answer all having the same thing in common, and the potluck cards could be anything. There are several generations of questions, so you could have a lot of fun mixing different ages into team play. Although it does state that this is an adult game, teens can enjoy it when playing with the adults. This is a different twist on trivia games. It’s filled with creative and fun questions on a wide variety of topics. Play in teams or individually to see who’s the smartest in the group. Number of Players: For 2 or more individual players or teams but is recommended to be played with at least 3 people. Playing Time: This is a fast play game but if you have some people who like to take their time, grab a timer and set a limit. Description: This game is challenging but it’s not as hard as some trivia games. Most of the questions are multiple choice or 50/50 answers. There are seven questions on each card with many different topics. You must get at least three of the questions right to move forward, but if you get less than three correct, you will have to move back instead. Be the first person or team to get to the finish line and you can be declared the champion for the day. This can be a fun team game with mixed ages to make it more challenging. 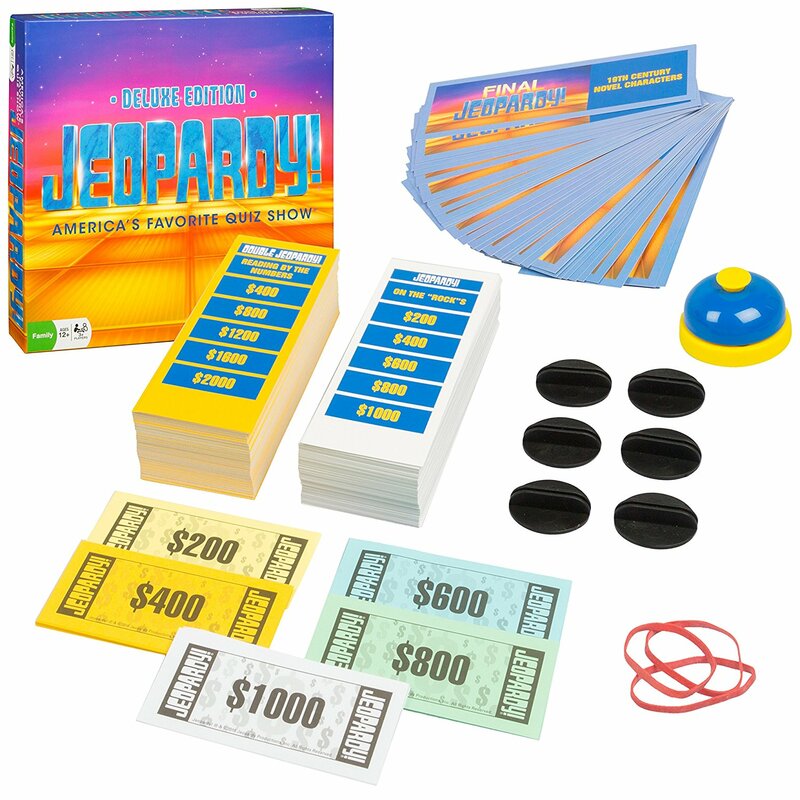 One of the longest-running game shows on television, and now you can get the Jeopardy experience right in your living room with this fun and challenging board game. Playing Time: It will move along quickly as you go through the gameplay using the buzzer. Description: Played just like the tv game, you will go through three rounds of jeopardy with six categories of questions and don’t forget to answer the questions with a question or your host might get upset with you. The game can be played with everyone ages 12 and older, and you might consider allowing a younger family member to be the host. The person who has the most money at the end of the rounds wins the game. This deluxe edition comes with a buzzer, so you can set the time just like on tv. This can make a great game for a group and even some might want to sit in the “audience” to cheer on their fans. Do you think you’re smarter than a 5th grader? You can challenge yourself to find out with this popular television game show. Playing Time: The time will vary depending on the number of players. Description: This game is played much like the tv game show; you have five levels of play from the 1st grade to the 5thgrade with eleven test questions that you must get correct. You do have the opportunity to peek and copy, but you should read the instructions carefully for scoring because it can be a bit complicated. You will read the game cards through a filter and that might make it a little hard to read so be sure you have an appropriate amount of lighting in the room. For every correct answer, you will have the opportunity to move up toward the million-dollar prize, but if nobody gets that far then the player with the most money wins the game. This can be a fun and educational game for all ages and will be a blast when the kids outsmart the adults. There you have it, the best trivia board games. 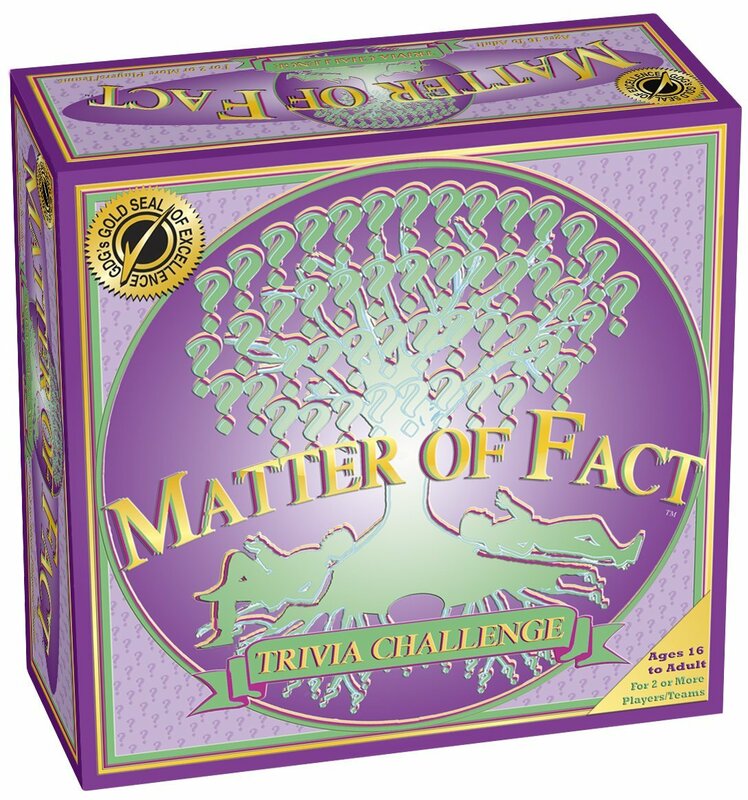 You will find that all these games are jam packed with fun trivia questions that will lead to hours of laughter.